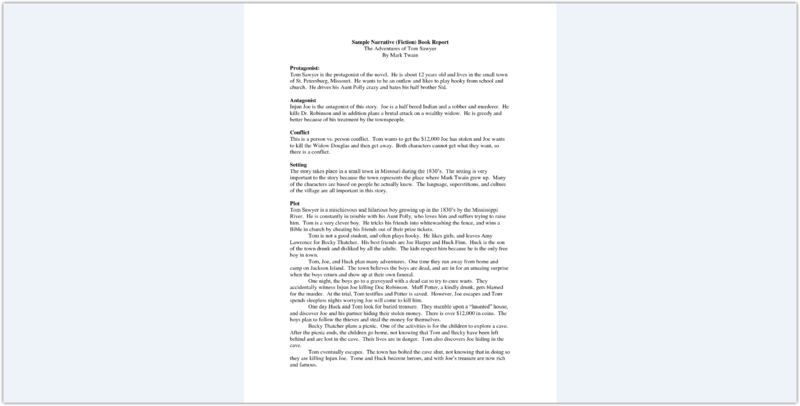 Book report is a short summary of any book. It may include short summed-up rewriting of a book plot, main ideas of a story and some important facts that an author mentioned. 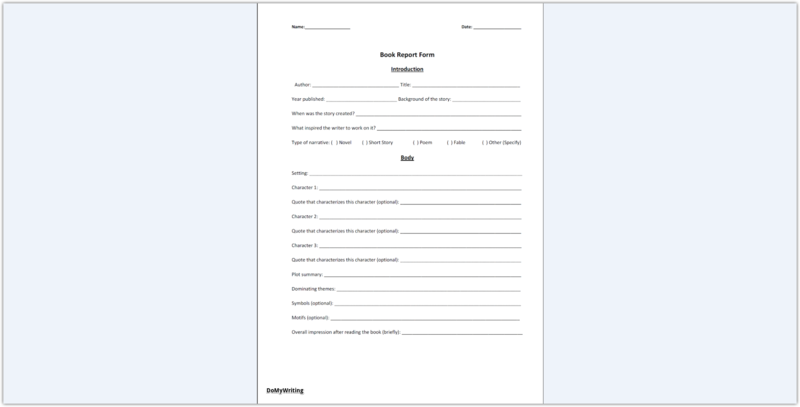 Many students are confused to tell difference between a book report and a book review. Some may say these types of writing works are the same. However, this is not true. In fact, book reports and reviews may appear similar but the aim of these writing works is not the same. Book reviews are usually created to give an evaluation to a book. It may include some information revealing the book plot. However, big parts of book reviews are dedicated to analysis of a writer’s style, credibility of facts and popularity of ideas and topics reflected in the book. A book review helps reader to understand if the book worth reading and how good it is according to opinion of review writer. Many high school and university students are asked to write a book review as a part of their academic study. At the same time, book reviews are often published in magazines, newspapers or internet sites and blogs. Book report tells what a book is about without giving any personal evaluation to it. Instead of analyzing style, popularity and informative veracity of a book, a report writer shall determine main stages of a book story and choose most important information and statements. The main aim of a report is making a reader familiar to what a book is about. After reading a correctly written report, readers may have feeling they are well-introduced to book’s ideas. Writing a book report is not as easy as it may appear. It requires lots of time and readiness to work with great amount of information. A report writer shall read a book attentively and understand what it tells about. Having clear understanding of ideas and plot of a book helps to determine which information is the most important. Small size of a book report is not what makes students happy. This time they have to find a way to express huge amount of information in 200-500 words only. 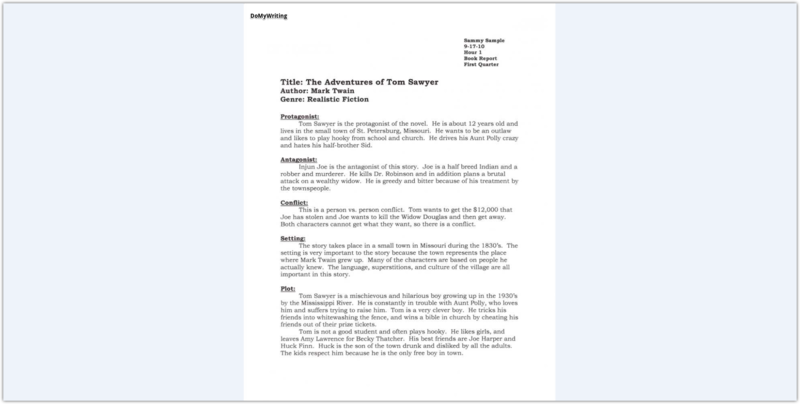 Writing a book report may be an assignment for middle-school students as well as for high-school and university students. Usually, high-school and university students face more complicated requirements. That’s why we will list those elements that are necessary to write an excellent university or high-school report. Plot Summary. This part is used to show what book is about. It tells shorter variant of a book story and includes only key elements of a plot. Theme Analysis. This part is used to tell more about theme of a book. It may include facts from historical or scientific background of a story. The part is used to give a reader more clear understanding of reasons and conditions of events that happened in the story. Key information about a book. Except main points of a plot, it’s also wise to include some general data like an author’s name, year of writing, number of pages, etc. Tell some interesting facts about what inspired an author to write a book or what stands behind fictional characters, if size of your assignment allows. Time when the events happen. Telling your readers which century or a year the book story is about is not always enough. You can also add some historical information about the time. Names of characters, their description. Description of a character reveals great part of information that an author wanted to say. Make this part maximally informative – it will help to give more clear understanding of a story. Supportive quotes and examples. In order not to make your own statements appear doubtful, add some quotes or use an illustrative example taken from the book itself. In a case your professor or a teacher didn’t tell you which book to write report about, think about one carefully. Choose a book that causes interest of your readers. It’s better to choose books that are known and reflect popular ideas. However, it’s also better to avoid those books that are too popular. Your readers won’t be interested in seeing one of hundreds reports written about the same book. Choosing a book with a very specific or narrow theme will guarantee your report being unique. At the same time, you are in a risk that a topic you chose will be difficult, not understandable or not interesting for your auditory. Read a book and stop on each paragraph, making notes. Even if you’ve read a book once or several times before, you may need to read it one more time to underline main ideas, interesting quotes, sayings and facts. Be ready to mark those parts that describe main characters or explain background. If you are reading a scientific book, be ready to check additional literature in order to understand its topic better. You shall be confident in what you are going to speak about in your report. Write down those sentences or parts of texts that may be used in your text directly as it’s written in the book. In a case you are allowed to include direct quotes to your writing work, they may serve you as great illustrative examples. In a case your work is automatically checked for plagiarism and may suffer from having unchanged phrases of another author, you can rewrite quotes, extracting their main meaning. Organize notes that you took while reading books and supportive literature. Separate facts and quotes into certain categories like: background information, plot summary, character description, etc. Check if you have enough information for each part of your future report. The best and one of the most working ways to get inspired before writing your report is to discuss your topic with friends or your teacher. In a case you are restricted to do it, use internet forums where you can talk about freshly read books with other internet users. 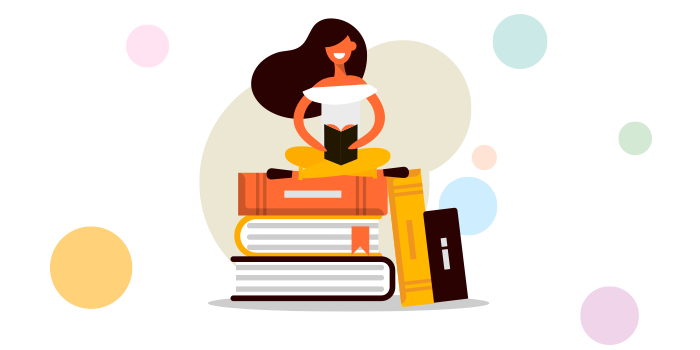 This will not only help you to understand whether a book and a topic you choose is interesting for society, but will also reveal other (sometimes opposite) points of view on the information you are working with. Diversity of ideas is a key to creative writing that may attract readers. Introduction. Introduction shall be attractive and informative at once. Try to make it understandable and easy to read. Include an interesting quote or a question. You shall also remember to use some facts like name of an author and a book, number of pages etc. The body. Writing a body paragraph, you shall remember that this part is the most important and informative. Tell book’s plot shortly. Be laconic, however, find a chance to mention some quotes and examples and to make objective remarks speaking about style and features of writing. Conclusion. Final part of your report is a summary of all abovementioned information. According to your teacher’s recommendation it may also include your own opinion about a book or may list reasons why you preferred a certain book or an author. It’s necessary to revise your work at least twice. Read it to evaluate tone of writing: whether your text is read easily. 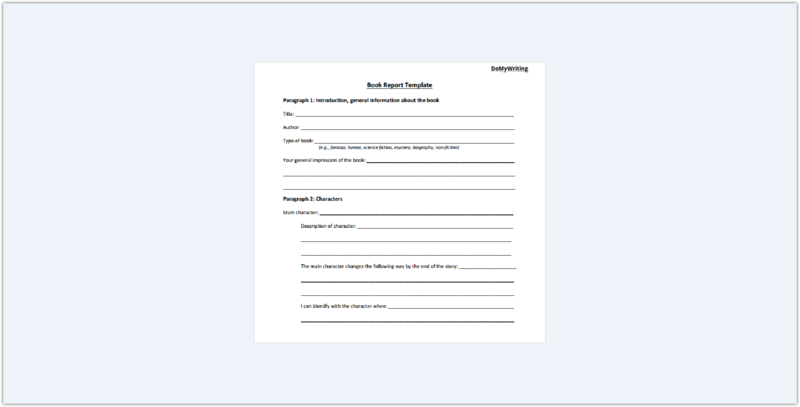 Evaluate structure of your report, add or change something if it sounds incorrect. You shall also read your report one more time proofreading it for mistakes or misprints. This time, you shall concentrate on grammar and spelling only. Be ready to spend some time for careful checking. Remember, that even smallest mistake may spoil result of your great and hard work. Writing a book report as a college assignment doesn’t differ much from what you wrote in high-school. However, being a college student you may meet more requirements concerning formatting of your text. It’s necessary to write the whole text according to an academic style required in your college. It can be APA, Chicago, MLA or others. Objective analysis of a book idea. If you are facing a task of writing a book report first time, you may feel puzzled. Creating an excellent writing work requires practice. However, you can’t put your general academic record in risk getting a lower mark for your book report. You can always address our team of professionals. We will supply you with best-quality writing works and will provide fast assistance with any type of academic assignments.